Cirrus is the most technologically advanced general aviation aircraft on the market to date. Along with the CAPS parachute system, Beverly Flight Center’s Cirrus Aircraft are equipped with state-of-the-art Garmin avionics along with synthetic vision, GFC700 autopilot, dual AHRS, 60/40 flex seating (seats up to 5 passengers), and tons more. Transitioning to Cirrus aircraft is a simple process at Beverly Flight Center. Our experienced CSIP and TCI instructors follow a strict syllabus provided by Cirrus Aircraft to guide new Cirrus pilots through our Cirrus program. Training will consist of both classroom sessions on the ground as well as sessions in the aircraft. Our Cirrus instructors will sit down with you one on one and get your Cirrus Learning Account set up. You will then follow the course guidelines and take home study material. 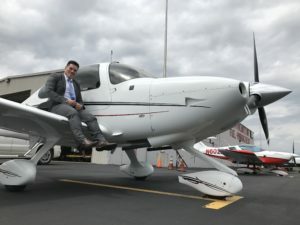 Your instructor will train you in the aircraft which will consist of aircraft operation on the ground and in flight, avionics work, hood work, traffic pattern and CAPS parachute operations, emergency procedures, and much more. Cirrus has specific standards for transition training that we follow by the book which will make you very proficient in the new aircraft. At the end of the training you will receive a certificate certifying your Cirrus Transition Training completion. The flight training will be conducted in our 2015 Cirrus SR20 or 2017 Cirrus SR20 G6. You may also consider receiving a high performance endorsement in our SR20 G6, as it has a 215hp engine.